Signed Wimpy Kid Books The Long Haul are here!!! 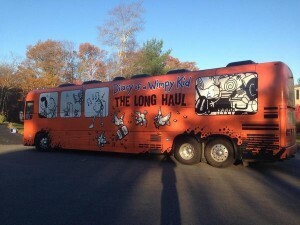 Signed Wimpy Kid Books:The Long Haul are here!!!!! Give us a call and come on down to get your copy today! Don’t miss out! There is still limited seating available for this Friday’s event at the Wyckoff Family YMCA. What better way for fans to spend the Friday afternoon of Teacher Convention than to hear best-selling children’s author Jeff Kinney for an hour long presentation and Q&A. The event runs from 3 – 4 pm. Each attendee must purchase a ticket. Each $15 ticket includes a copy of Diary of a Wimpy Kid book 9, The Long Haul, autographed by Jeff Kinney. Please note that this is a presentation and Q&A only. There will not be a meet and greet or book signing after.